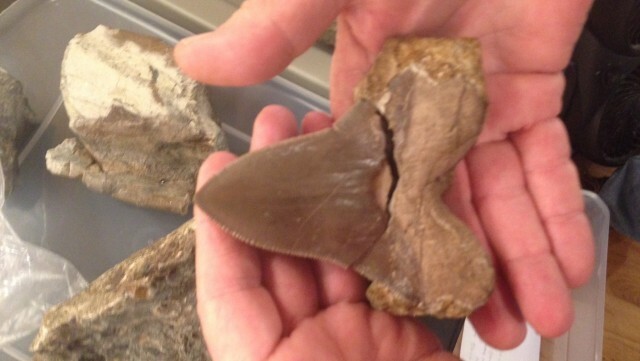 Shark teeth like this one from C. megaladon, nicknamed "Mighty Mouth" have been found in the fossil beds at Sunol. It’s hard to imagine the ocean lapping at the base of the Sierra Nevada, but the Temblor Sea, a vast-inland marine environment, once covered our area. Populated by sharks of mythic proportions, hippo-like mammals called Desmostylia, and small baleen whales along with scallops, clams and other benthic fauna, the Temblor supported a variety of now-extinct life. 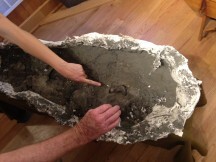 A fossilized baleen whale skull encased in "field dressing" plaster clearly shows the inner ear bones. Some of these fossils are coming to light millions of years later as the Calaveras Dam Replacement Project, part of San Francisco Public Utilities Commission’s (SFPUC) $4.6 billion Hetch Hetchy Water System Improvement Program, is underway. Started in 2010, the new dam on Calaveras Creek near Sunol Regional Wilderness will provide over half the drinking water storage capacity for over 2.6 million SFPUC customers. The current dam is 89 years old and within 1,500 feet of the active Calaveras earthquake fault. It will be replaced with a more seismically stable dam by late 2018. 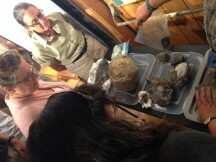 EBRPD naturalist staff examines fossils found in the Calevaras Dam retrofit at Sunol. Paleontologists work hand-in-hand with the construction crew as part of the environmental compliance team and help to unearth and preserve significant fossil finds. The fossil beds they’re encountering are providing tantalizing glimpses into ancient ecosystems. Two SFPUC paleontologists came to talk with the naturalists at the East Bay Regional Parks and shared some of their findings. It was quite a special experience to see an ancient baleen whale skull encased in a plaster “field jacket” with its perfectly preserved petrosal (or ear bone capsule) exposed. The giant shark tooth from a species of Megalodon up close was stunning, too. These fossil finds are helping scientists to put together a paleo-ecosystem down to the level of rainfall and even the evolution and lineage of different plants and animals. Check the Cal Academy’s website to find out more about our fascinating fossilized past. The University of California, Berkeley's Museum of Paleontology has online exhibits that can also help you learn more. To find out more about the Calaveras Dam Replacement Project, visit the SFPUC website.